Some projects take more time than others. This one took about 20 years! Living Letters is a reincarnation of a typeface (and book) I designed in 1989. 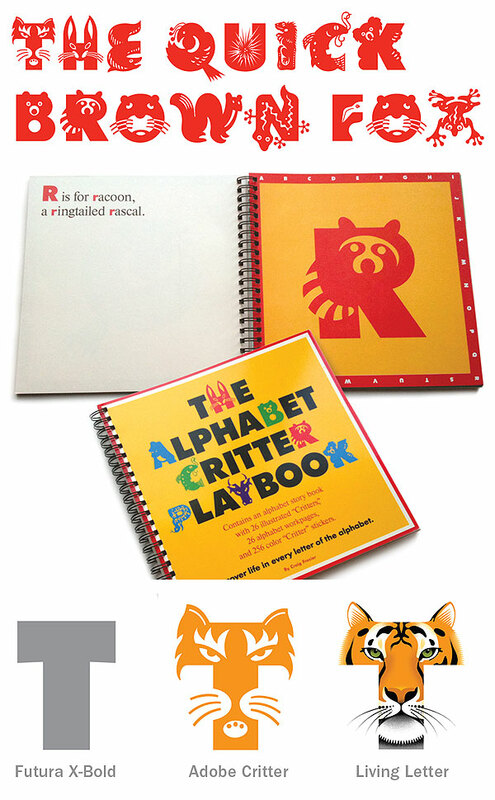 The original book was called The Alphabet Critter Playbook, which caught the attention of Adobe who then asked me to create the font Critter (1992). Initially drawn by hand and inked on vellum, the font was translated digitally at that time using Adobe Illustrator and a program called Fontographer. About 4 years ago I began to redraw the Critters bringing more detail and more life to them. I was particularly interested in depicting accurate features like eyes, ears, fur and color. The internet proved invaluable in sourcing animal reference—far more than I had in 1989. The challenge was adding considerably more detail to each animal while maintaining its recognition as a letterform. I have partnered with Adobe and HP in announcing the release of Living Letters. Adobe has created a pop-up store in San Francisco and for two weeks the public can visit Russell Brown’s (Photoshop guru) Extreme Imaging corner of the store and get a custom t-shirt digitally printed on the spot with the letter of your choice. You may also pick up a digital copy of the book produced by MagCloud or go to their site and order a book with your choice of 26 covers. The books are ‘magazine’ style with soft cover and are the best digital printing I have seen to date. Can teachers purchase this font? It would be perfect for the phonics work I do in my first grade classroom. Love how you use the negative space as well, adds so much variety and brillance! It’s just perfect for kids to learn letters in such a fun way! This honestly is so awesome. I mean a perfect font for kids. Great work.